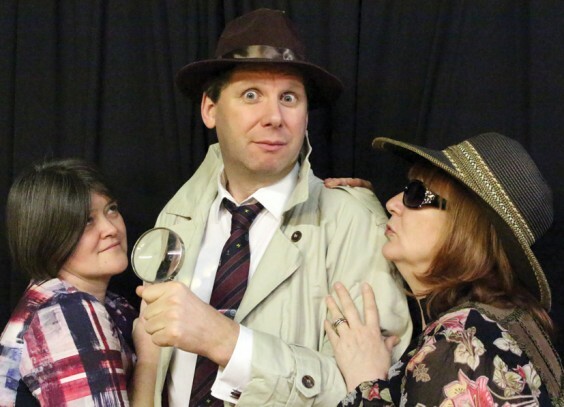 Alvechurch Dramatic Society welcomes the legendary Inspector Drake back to the village stage for the first time since he solved his ‘Last Case’ back in 2002. In Inspector Drake and the Perfekt Crime, a comedy by David Tristram, madcap humour, clever wordplay and general silliness abound as Drake and the hapless Sergeant Plod attempt to unravel a plot with more twists in it than, well, a really twisty thing. Who is the mysterious Doctor Short and why did he marry a warthog? Has he murdered his fourth wife – or did she murder him first? Has he really got two daughters called Sabrina? Where is Frank the taxi driver? What was the Pope doing in the woods? And perhaps most importantly, why is there a lamp post in the living room? These are just some of the questions facing the self-styled “world’s most famous detective”, as he gropes for the answer to the perfect crime, groping some suspects along the way. . . Above: Sarah Batstone (Miss Short), Chris Davies (Inspector Drake) and Sue Resuggan (Sabrina).